The European Space Agency (ESA) led Rosetta Mission made history last year by becoming the first spacecraft to orbit a comet and deploy a lander onto its surface. 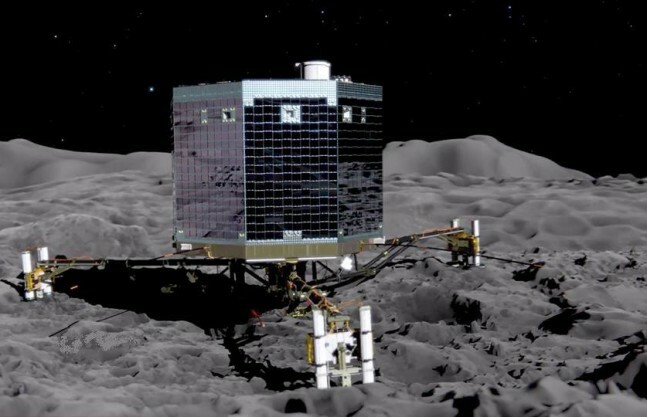 The Philae lander touched down on the comet’s surface on Nov. 19, 2014. The washing-machine sized lander’s anchoring system failed to deploy and the probe bounced across the comet’s surface, ending up in the shadows. After sending all the data collected back to Earth, Philae entered into an indeterminate hibernation period until it could collect enough solar power to function. For the first time since November, scientists from the German Aerospace Center (DLR) will attempt to contact the stranded comet lander Philae on Thursday Mar. 12. Several conditions must be met for Philae to start operating again. First, the interior of the lander must be at least at -49 degrees Fahrenheit (-45 ºC) before Philae can wake up from its winter sleep. At its new landing site – Abydos – only a little sunlight reaches Philae, and the temperatures are significantly lower than at the originally planned landing location. The lander must also be able to generate at least 5.5 watts using its solar panels to wake up. Ulamec believes that an even better opportunity to restore the communication with the lander will come in May. “I think we do have a fair chance to get contact with the lander again. 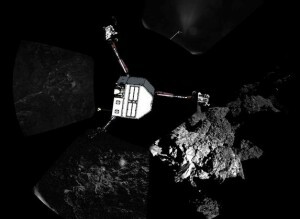 I do see it more likely though, to have Philae re-activated around May, when comet and lander are closer to the Sun,” he said. Once awakened, Philae will switch on its receiver every 30 minutes and will listen for a signal from the Rosetta spacecraft. Philae needs a total of 19 watts to begin operating and allow two-way communication. It could be that the lander has already woken up from its winter sleep some 500 million kilometers away from Earth, but does not yet have sufficient power to communicate with Rosetta. Ulamec hopes that if the lander wakes up, it will still be able to conduct scientific experiments. “This depends on the power and energy available. First, we will have to be modest and conduct temperature measurements, etc. If it is possible to re-charge the battery, more demanding activities, like another attempt to take samples or another radar-scan, could be performed,” he revealed. Before contact was lost with Philae, it managed to deliver a tremendous amount of significant scientific data. 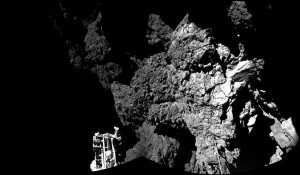 “After the separation, about 16.2 MB of data have been downloaded from Philae to Earth. There is lots of science in those, like 7 usable panorama images!” Ulamec said. So far, Philae’s exact location has not been identified on images acquired by the Rosetta orbiter, so the operations team at DLR is currently working with the information they have from the lander’s cameras, along with the knowledge gained from the solar energy conditions experienced in November. Rosetta is a European Space Agency mission with contributions from its Member States and NASA. The Rosetta lander, Philae, is contributed by a consortium led by DLR, the Max Planck Institute for Solar System Research (MPS), the French Space Agency (CNES) and the Italian Space Agency (ASI).